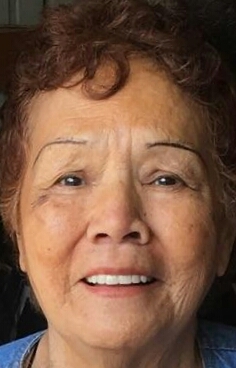 Obituary for Juanita P. (Partida) Gomez | Schaffer Funeral Home, Inc.
Juanita P. Gomez, 83, of Defiance, passed away on Wednesday, February 13, 2019 surrounded by her loving family at her home in Defiance. She was born on August 29, 1935 to the late Cosme and San Juanita (Morales) Partida in Edinburg, Texas. On March 27, 1953 she married Helario M. Gomez, who preceded her in death on September 23, 2008. Juanita was a faithful member of St. John Catholic Church in Defiance. She worked for several years at General Motors in Defiance until her retirement in 1992. In her leisure time she enjoyed cooking, bingo, gambling at Hollywood Casino, shopping, family dinners, spending time with her family, and especially the Thanksgiving dinner. Juanita was dedicated to her family, and was so proud of her children and grandchildren and their accomplishments. Juanita will be sadly missed by her sons, Tomas (Irma) Gomez, Sr. of Defiance, Larry (Clara) Gomez, Sr. of Defiance, daughters, Sylvia Cruey of Holgate, Yolanda (Jacob Sr.) Salinas of Holgate, Betty (Elias Sr.) Salaz of Defiance, Debbie (Rick) Schlotterbeck of Ayersville, Ann Gomez of Defiance, Olivia (Samuel Sr.) Alvarado of Defiance, and her brother, Julian Partida of Edinburg, Texas. She was a proud grandmother to 28 grandchildren, 48 great-grandchildren, and 1 great-great-grandchild. In addition to her parents, she was preceded in death by her husband, Helario Gomez, daughter, Belinda Mireles, three grandchildren; Christina Gomez, Jacob Salinas, Jr., and Sarah Gomez, brothers, Helario and Tules Partida, and son-in-law, Rodney Cruey. Visitation will be held from 2-8 pm on Friday, February 15, 2019 at Schaffer Funeral Home in Defiance, with a Vigil Service at 2:00 pm. A Mass of Christian Burial will be celebrated at 10:00 am on Saturday, February 16, 2019 at St. John Catholic Church, with Fr. Eric Mueller officiating. Burial will follow the service at Riverside Cemetery. Memorials are suggested to St. John Catholic Church.